The 2014 IBS 600-Yard Benchrest Nationals will take place this upcoming weekend in Memphis, Tennessee at the Memphis Sport Shooting Assn. (MSSA) Range. The match runs Friday, September 26th through Saturday, September 27th. Set-up and practice sessions will be held on Wednesday and Thursday. The for-record matches will commence with the Light Gun division at 8:05 am on Friday. Heavy Gun matches will be held on Saturday. IMPORTANT — You can still join in the fun. It’s not too late to register for this event. You can register at the range up to 6:00 pm on Thursday, September 25th. Mike Moses is the Match director. The MSSA Range is located about 25 miles northeast of Memphis, TN. Click here for directions and hotel links. Light Gun Competition – Friday, Sept. 26th. Sign in by 7:30 A.M. Firing will begin 8:05 A.M. Relays will fire in sequential order #1, #2, #3 & #4. Heavy Gun Competition – Saturday, Sept. 27th. Relays will fire in the order of #3, #4, #1 & #2. The current Match Registration fee is $200. (This includes lunch for both days). Registration deadline is 6:00 pm, Thursday, September 25th. 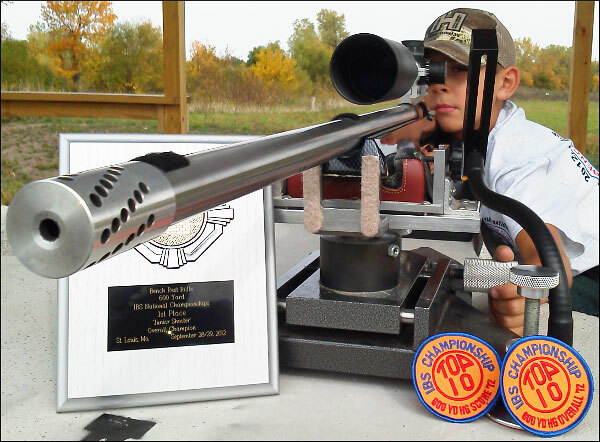 10-year-old Rory Jacobs competed at last year’s IBS 600-yard Nationals in St. Louis, Missouri. Event tip by Samuel Hall. We welcome reader submissions. 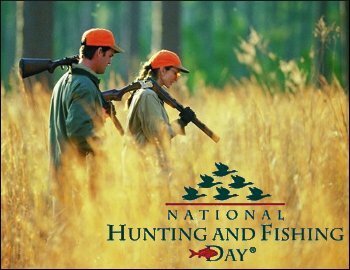 Share the post "IBS 600-Yard Benchrest Nationals in Memphis September 26-27"
National Hunting and Fishing Day (NHF Day) takes place on Saturday, September 27, 2014. The annual celebration serves as a reminder that conservation succeeds because of leadership and funding from hunters, shooters and anglers. National, regional, state and local organizations will run thousands of “open house” hunting- and fishing-related events around the country. Events will include Fishing Derbys, Hunting Expos, Wing-shooting tournaments, and much more. Over four million Americans will participate. For information on NHF Day, visit www.nhfday.org. To find NHF Day events, click the link below. Share the post "September 27th is National Hunting and Fishing Day"
If you’re looking for loaded ammunition at affordable prices, WikiArms.com can help you find a good deal. WikiArms constantly searches the listings of ammo vendors across the web. Then WikiArms ranks the offerings by cost per round, low to high. This way you can instantly compare prices from multiple vendors including Ammoland, Brownells, Cabelas, Lucky Gunner, MidwayUSA, Natchez, Sinclair Int’l, Slickguns, Sportsmans Guide, and Wideners. Search bots refresh pricing constantly so listed prices are normally current within five minutes. WikiArms even displays the amount of product currently in stock for each vendor. Using WikiArms is easy. Just click your choice of caliber (such as 9mm, .22LR, or .308 Win) on the navigation bar, or hit the Good Deals link to see a variety of cartridge types all at one time. WikiArms is fast, and it is FREE to use. Check it out. 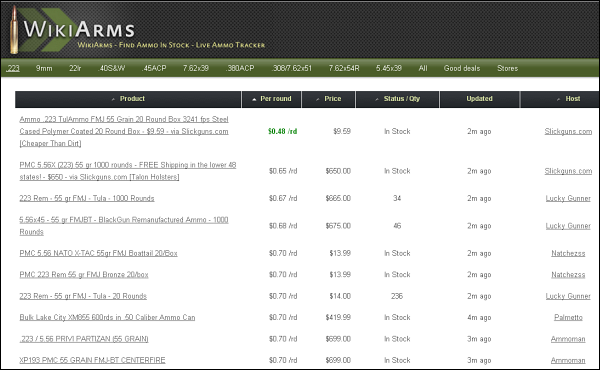 Share the post "Track Ammo Prices and Availability with WikiArms.com"